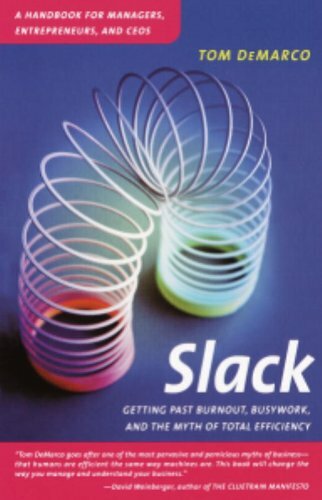 about this book: Slack is what's missing from your life. Just as important, slack is what's missing from the work life at most organizations. Yes, efficiency is important, but at what cost? If you and your colleagues are 100% efficient -- if you can even imagine such a thing -- there is no time left in the workday for reinvention or creativity, no time at all to respond to a sudden need in the marketplace. Look what's happened in the world of medicine. Doctors and nurses are working at near 100% efficiency, no slack. So YOU (the patient) have to wait. The closer they get to total efficiency, the more patients are needed to be stacked up in the waiting room, ready to busy the doctor again the instant he/she gets free. Your company is up against the same dynamic. The more perfectly efficient you are, the longer your customers have to wait for you to respond to anything new. Efficiency at the max, but flexibility . . . oops. You're like a car that goes really fast but has no steering wheel. As long as there is nothing but straight road ahead, you rule. But watch out for curves. Tom DeMarco's now iconic book Slack makes the case for a radically different way to organize any company that needs to be dynamic. There is insight (and humor) on every page. From the author of Peopleware.